This forum can b used 4 a number of things besides planning kr activity. U can post ur nindo and look at da tnr faq. The faq can help with a lot. Now then 2 da point. when u go 2 da home page, u c a couple of topics called forums. Inside forums, u have things called topics. Only admins like me and buddd can create forums. But all members can posts topics. And posts r replies 2 da topic. There r some topics which i don't want any1 2 add topics 2. 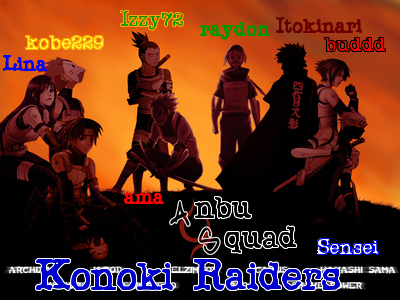 These r Konoki Raiders plans and TNR FAQ. U can reply 2 posts but don't start topics. Or i will delete them on site. On nindo, i want every1 2 lock da topic if they can. I don't want any replies 2 a nindo topic. If u ahve a comment, pm da person. If u post something in Comments, Suggestions, or Questions, it bettr have 2 b a comment, suggestion, or question. Don't go off-track. I don't care what u put in da free-for all. But don't talk bout anime. I'll add a anime forum. Some users can't c certain forums. Only mods can c my anbu's plans. Only admins can c co-leader's planning. So every1 else doesn't c dat forum at all. Its like da forum was skipped. This forum is bbcode enabled just 2 let u know. And u can put smileys as well. Only admins can announe stuff. Only mods and admins can post stickies. Ur avatar can b as big as u want. There r also usergroups. Join the 1 u belong 2. Like if u r a genin in tnr, go 2 da usergroup as/genin. U also have da rite 2 join da group u belong 2 and all da 1's below u.
ex. a jounin can join da jounin/sensei usergroup. he can aslo join as/genin and chuunin usergroup.